It's senior portrait season! 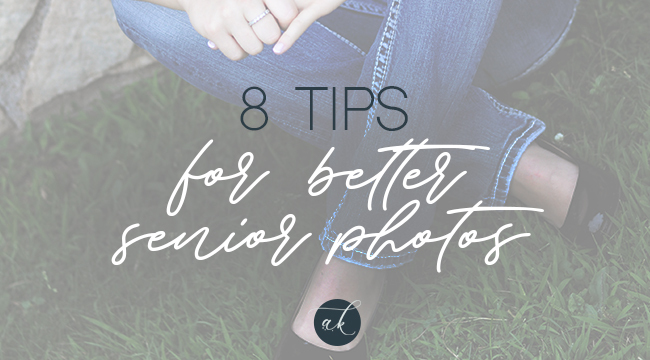 Here are a few tips to make sure your senior photos come out perfectly. 1. Don't force your smile. This is the #1 mistake I see in every kind of portrait. Remind yourself to relax! You may be tempted to ‘practice’ your smile in the mirror, but usually this just leads to unnatural looking photos. 2. Wear something you know and love. It’s SO tempting to go out and shop for new outfits for your senior portraits, but it’s usually best to stick with clothes that you've already worn at least a few times. You’ll be more comfortable and will look more confident in clothes that you know. 3. Avoid haircuts too close to picture day. You want to look your freshest on the day of your senior photos, no doubt. But it takes a week or two to ‘grow into’ a haircut. Try to make sure your visit to the salon is at least a week before your photoshoot. 4. Don't wear neon colors. If it’s neon orange, pink, yellow, green or any other color that could be used as a highlighter, avoid it! 5. Bring multiple wardrobe options. You might already know exactly what you want to wear for your senior photos, but consider bringing a few options to change into. Of course these photos are for YOU so you should wear what makes you comfortable, but after seeing 40 photos of yourself in the same shirt, you might be wishing you had switched it up at least once. 6. Don't overdo the makeup. With all the makeup Youtubers and tutorials flying around the internet these days, you might be tempted to get bold with your makeup. If that’s your thing, great! Just start with some natural looking makeup, then apply that bold lipstick or eyeliner toward the end of your shoot so you have the option to keep or ditch the look when you choose which photos you want printed. 7. Don't worry about blemishes. When you look back on your senior photos, you want to remember who you were at that time and what your thing was. Whether it’s your dog, musical instrument, books, paintings, or sports equipment, you are welcome to bring it along on your shoot!